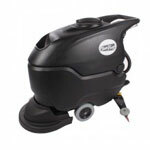 This CleanFreak floor buffer simply blows the competition away! There is simply no other way to put it. An American made machine with this type of warranty (5 years), at this price point, is simply unheard of. There are no strings attached or caveats, it truly is a spectacular machine at a great price point! The machine itself is powered by a 1.5 HP, UL listed motor, has an all steel frame, and utilizes a triple planetary drive system. It comes with a pad driver and a 5 year warranty on the motor, shroud and frame, & 1 year on parts. The motor is powered by high-torque dual capacitors for easy start up on high friction surfaces such as carpeting. 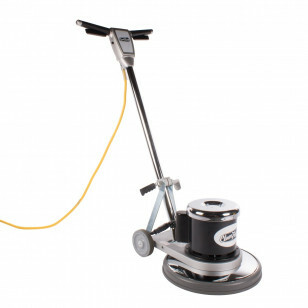 You can have complete confidence that this machine will stand up to years of use, no matter you're doing with it (buffing, stripping, or scrubbing hard floors or carpets). If you're not sure if this machine is right for your needs, please feel free to take a look at our full lines of low speed floor buffers, dual speed buffers and high speed burnishers. Or, please give one of our jan/san experts a call today at 855-242-9029 for a personal recommendation on what will work best for you. High end all metal frame ensures years of durability no matter what type of job you're using this floor buffer for. 1.5 HP UL listed motor, triple planetary gear box & an all chrome handle are all finely crated in the U.S. for added confidence & longevity. Lock out safety switches on the handle prevent accidental start ups & provide quick stopping capabilities. Comes with a 16" diameter pad driver to hold 17" pads for buffing, scrubbing & stripping (brushes & other accessories sold separately). Backed by an outstanding 5 year warranty on the motor, shroud and frame, & 1 year on parts.